Do you have enough income to retire? 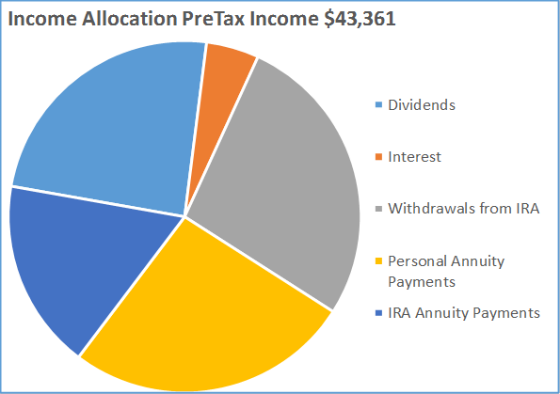 In Parts I and II in this series, I suggested that you could receive more retirement income with less volatility if you and your advisor moved from asset allocation to income allocation. It’s one thing to suggest and another thing to prove. So we conducted a study and will publish the full results and the underlying methodology in the next few weeks. 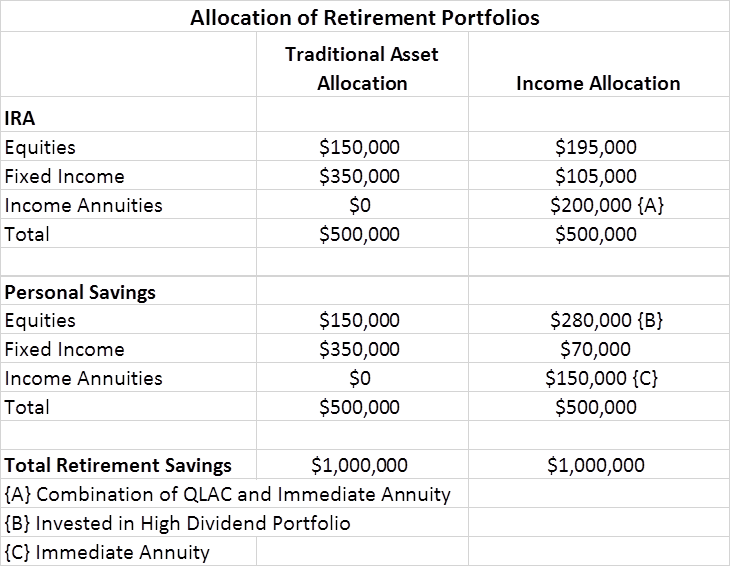 As you will see, there are dramatic advantages to focusing on income allocation. Pre-tax income is increased by 32% over the investor’s lifetime. Income volatility is reduced from 72% to 29%. The investor can spend the extra income or reinvest it to leave a legacy as much as 40% higher. Sound too good to be true? Let me walk you through the numbers and the explanation for these advantages. The twin goals of income allocation are to increase the amount of after-tax (spendable) income and to reduce income volatility (for more dependability). Here are three steps that distinguish the income allocation strategy from virtually all other retirement planning strategies. Include income annuities as a new asset class and consider them as part of the allocation to fixed income investments, along with bonds and CDs. Treat rollover IRA accounts differently than personal (after-tax) savings accounts in managing the equity portion of your portfolio. Manage withdrawals from rollover IRA savings rather than simply taking the IRS-mandated required minimum distributions. 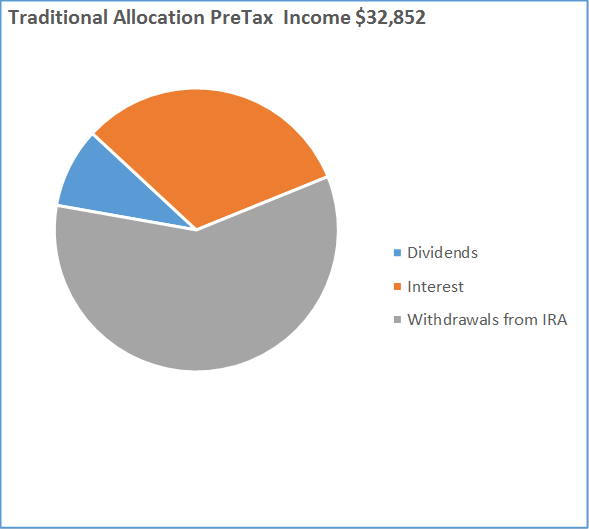 The following two pie charts illustrate how those steps translate to greater income and less volatility (as measured by the amount of rollover IRA withdrawals dependent on market returns). Income Volatility: The percentage of income that is dependent on the market value of the underlying investments (such as stocks or bonds). Volatility can be up or down, good or bad, but in all cases, it makes your planning uncertain. Effective Rate of Return: The rate of return your savings would have to earn in an asset allocation plan to produce the income and legacy benefit that emerge, typically to a survival age the investor selects. There is a substantial increase in the effective rate of return under the income allocation strategy. The case study at the end of this article quantifies the benefits for our investor. 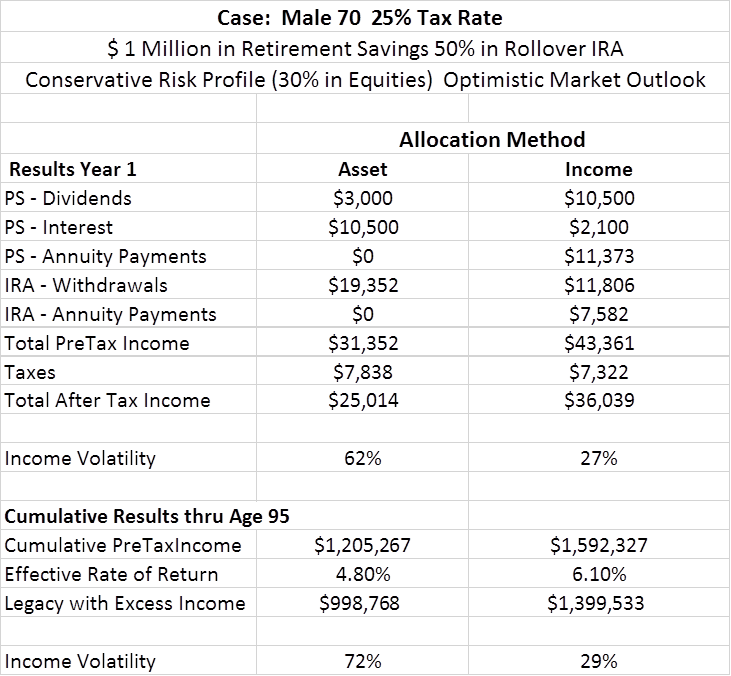 It shows an increase in first-year income of 38% (from $31,352 to $43,361) and a 35% decrease in income volatility. Of course, everyone is different and any conclusion you make should be based on an illustration designed specifically for you. The advantages derive from a focus on holdings that generate the highest amount of dependable, spendable income, as suggested in this chart. While the study quantifies the dollar-and-cent advantages, the real upside, or “soft power,” may be the qualitative benefits – which in turn may also create even more advantages not accounted for in our study. What do I mean by soft power? By providing more income with less volatility, the investor achieves peace of mind knowing that income is less dependent on the market, continues for life, and is more certain. Besides less “angst,” the investor is much more likely to stay the course. One can imagine what investors might do during a major correction if 50% or more of their portfolio is dependent on market results. Typical retirement planning leaves the investor with plenty of uncertainty. 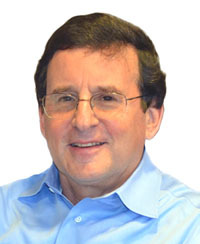 If you have a question about how income allocation might work you or would like a copy of the study when it comes out, post your request on Ask Jerry. Asset allocation answers: Do I have enough money to retire?